Each year at Easter, thousands of pilgrims make their way along the Via Dolorosa in Jerusalem to retrace the steps of Jesus Christ as He walked to His death. The pilgrimage ends in the Church of the Holy Sepulchre, the site of Jesus’ death and therefore the most holy place on earth according to the beliefs of the Roman Catholic, Eastern Orthodox and Oriental Orthodox churches (which include Armenian, Coptic, Syrian and Ethiopian groups). Yet just a short distance away lies the Garden Tomb—the site that many Protestants prefer to call Christ’s burial place. Which group has it right? Can we know the true location of Christ’s burial, and does it make a difference in a largely indifferent world? The search for an answer takes us back to Jerusalem in the first century. Jesus Christ is handed over to the Roman governor, Pontius Pilate, who orders His death to please the local political and religious leaders. Details of this event cannot be found in any secular source; we have to turn to the New Testament’s Gospel accounts for the only information available. Those accounts state that Christ was crucified—the traditional Roman method of execution—outside the city in a place where people could watch and thus learn from the example. The spot was known by its Aramaic name, Golgotha, or “place of a skull.” No other writings from the first two centuries mention or identify this location. Close by was a garden with a new tomb that had never been used. The body of Jesus was placed in that tomb, a stone was rolled across its entrance to seal it, and a sentry was posted to prevent anyone from stealing the body. Three days later, after an annual holy day and the weekly Sabbath, a group of grieving women who had been followers of Jesus came to complete the burial process. They were amazed to find the stone rolled away from the entrance and the tomb empty, and they ran to tell the disciples. But one of the women remained at the tomb and questioned a person she thought to be a gardener. She wanted to know where the body of Jesus had been put so that she could give Him a proper burial. She was quickly overwhelmed with joy when she heard the voice that responded. It was the friend for whom she grieved. In finding Him, her search for His burial place came to an end. Indeed, it seems that no one paid any more attention to the location of Jesus’ tomb for centuries—until A.D. 326, in the time of Emperor Constantine. The Gospel accounts give a brief description of the tomb, which correlates to the archaeological evidence available today regarding first-century tombs in the area of Jerusalem. But no specifics are given as to the tomb’s proximity to Jerusalem, much less its exact location. After the event, only two biblical writers even make reference to the place of Jesus’ death. The writer of the Epistle to the Hebrews simply states that it was “outside the gate” of the city (Hebrews 13:12)—the usual site for a sin offering. The writer of Revelation alludes only to the city where Jesus died (Revelation 11:8). No writer in the first two centuries mentions the location of the tomb. The New Testament nowhere indicates any interest on the part of early Christians in the place of the death and burial of Jesus Christ. Furthermore, the New Testament nowhere indicates any interest on the part of early Christians in the place of the death and burial of Jesus Christ. The only site in Jerusalem that appears to have been significant to them was the Jewish temple on Mount Moriah. What mattered to Christians of the first century was that Christ was the Lamb of God who had been resurrected from the dead and now sat at the Father’s right hand as High Priest and Intercessor. Why, then, some 300 years later, should people become concerned about the location of His death, burial and resurrection? It is instructive to note the development of Jerusalem after the death of Jesus. 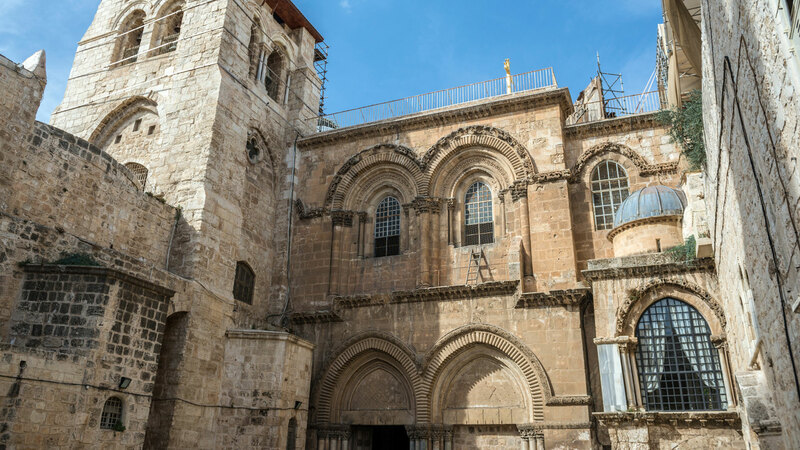 In about A.D. 41, Herod Agrippa I extended the wall of the city to the northwest, enclosing within it the site that is now the Church of the Holy Sepulchre. While little archaeological analysis has been performed in this sector of the city (known today as the Christian Quarter), Kathleen Kenyon, among others, found evidence of housing there. It is reasonable to conclude that sometime between the building of the wall and the demolition of the area in A.D. 135, this became part of the city and, accordingly, houses were built throughout the area. During two ill-fated Jewish revolts against the Romans starting in A.D. 66 and 132, Jerusalem was systematically destroyed. In 135, the emperor Hadrian razed the city and rebuilt it as Aelia Capitolina. It was a pagan city, complete with pagan temples and worship. The northwest section was leveled and the entire topography radically changed. At least one Israeli archaeologist now believes it became the encampment for the Roman Tenth Legion, which wasn’t withdrawn until the early years of the fourth century. From the time of Hadrian, a Roman temple—thought to have been dedicated to either Jupiter, Venus or Tyche—covered the site where the Church of the Holy Sepulchre now stands, though archaeological evidence conflicts with the written record of Eusebius, a church historian who was also the Bishop of Caesarea. It may be that the temple had honored more than one god through the intervening years. Eusebius claimed that the pagan temple was actually built on the known tomb of Christ as an act of desecration. This does not accord with Hadrian’s treatment of Christians, however. While he decreed that Jews could enter Aelia only on penalty of death, Christians were allowed to continue residing there. The city remained under Roman control for the next few centuries. In the late third and early fourth centuries, Constantius Chlorus was emperor over the western extremities of the empire, ruling from England. When he died in 306, his son Constantine was proclaimed his successor. Constantine returned to Rome and in time overthrew his various rivals. He ruled as sole emperor from 324 until his death in 337. This desire to see buildings established found its ultimate fulfillment in Constantine’s instruction to Macarius, Bishop of Jerusalem, to build a church in that city to honor the death of Jesus Christ. As part of Constantine’s wish to see the empire worship according to his new religion, he told Macarius to destroy the pagan temple that already existed, purge the land around it by removing everything to the bedrock, and build the church there. This instruction appears to have been motivated more by his desire to cleanse Jerusalem of its pagan past than to memorialize a sacred place. But to the surprise of the workers, when they destroyed the pagan temple, they found it was built on the site of a tomb. Without the benefit of evidence, they assumed it to be the tomb of Christ. In trying to link the site of the pagan temple to the tomb of Christ, writers today are limited to two imprecise statements given in the second and third centuries about the site of the crucifixion. The place of the tomb was simply known to be “nearby” according to the record of the Gospels. First, Melito of Sardis, writing in the second century, stated that Jesus was killed in the “middle of the street” in Jerusalem—the same Greek word used in Revelation 11:8. While this is generally translated in English as “street,” some wish to define a specific location from the word and thus translate it as “plaza.” Melito may well have simply borrowed the expression from the writer of Revelation, but most commentators prefer to believe that he came up with the term himself, and that it therefore proves his knowledge of the location of the crucifixion (though there is no proof that he even visited Jerusalem). Second, Eusebius, writing at the end of the third century just prior to the rule of Constantine, stated that Golgotha, the crucifixion site, was in the city, either on the northern side of Mount Zion or north of Mount Zion. The exact translation of the historian’s description depends on where the translator would like the site to be. But Eusebius himself gave no reference as to the location of the tomb. Did those involved in building the church in Jerusalem anticipate locating the site of Jesus Christ’s death and burial? Perhaps the best answer to this question comes from Constantine’s own pen. Although he was not reluctant to reveal the visions and directions that he felt he had received from God, there is no record of such claims or insight regarding the location of the tomb. When Helena, Constantine’s mother, toured Palestine in search of biblical sites, she attributed her finds to divine guidance and the help of a local who claimed to have knowledge of such sites. Yet Constantine described the discovery of the tomb as completely unexpected. Writing to Macarius, he stated: “For the evidence of his most sacred passion, long since hidden under the ground, to have remained unknown for such a long period of years, until through the removal of the enemy of the whole republic it was ready to be revealed . . . truly surpasses all marvels” (emphasis added). The surprise of the discovery is also expressed in the additional instructions Constantine gave to Macarius to build the finest of buildings with state funds. He allowed the use of unlimited quantities and qualities of marble, a substance at that time controlled by the emperor. Whatever was needed was to be provided as this now was to be the focal point of Christian interest. Clearly Constantine’s earlier instructions to Macarius to remove the pagan temple and replace it with a church had not been predicated on the discovery of a tomb. But following such a discovery, the building project took on a whole new dimension. The end result was the establishment of a building of the highest importance to the Orthodox and Roman Catholic communities—their most holy place. During the last decade, much material has been written about the Holy Sepulchre. Martin Biddle, professor of archaeology at Oxford University, has been closely involved in the quest to restore the tomb and its edicule, the little house that encloses the tomb. Acknowledging the paucity of early Christian information, he states: “Although there has been no lack of surmise, nothing whatever is known of the later history of the Tomb of the Gospels in the period down to 135” (The Tomb of Christ, 1999). Indeed, there are no eye-witness records to verify the assumption that this was the tomb of Christ, and nothing has been recorded to authenticate the discovery. At best it was the chance discovery of an anonymous tomb that supplied a convenient significance to the task at hand. Eusebius himself casts doubt on the story, because he refers to the discovery of a cave rather than a tomb. No archaeological research has been undertaken to establish whether it is, in fact, a first-century tomb. Indeed, any archaeological research will probably date the tomb as fourth-century at the earliest, as the degree of alteration to the site by Constantine’s workmen has likely obscured any evidence that the tomb might have been older. Of interest is the fact that some 15 meters from the tomb is another tomb known as the tomb of Joseph of Arimathea. Yet the Gospel records show that it was his tomb where Christ was buried (see Matthew 27:57–60). Protestants have often chafed at Roman Catholic and Orthodox claims relating to the Church of the Holy Sepulchre. When the so-called Garden Tomb was discovered by a peasant in 1867 and reported to the world in 1874 by German archaeologist Conrad Schick, the correspondent of several learned societies, they had what they thought was a suitable alternative. In 1883, British general Charles Gordon pronounced the tomb to be that in which Jesus Christ was laid, and he identified the adjacent skull-like outcrop of rock as Golgotha. Today the tomb is owned and maintained by the Garden Tomb Association. It stands in beautiful surroundings that have been developed over the years and appears to meet all the criteria expressed in the Gospel accounts, including the fact that it stood outside the walls of Jerusalem. The venue attracts numerous visitors who are often impressed by its serenity and tranquillity, in stark contrast to the Church of the Holy Sepulchre, situated as it is in a noisy city street in the middle of the Christian quarter. The latter is also infamous for the turf wars between the various religious orders that supervise it. The only difficulty is that, according to archaeological analysis, the Garden Tomb appears to have been created in the seventh century before Christ. So this clearly could not have been the new tomb to which the Gospels refer. The Garden Tomb is in an area of Jerusalem that has numerous tombs cut from the rock, all dating to the seventh and eighth centuries before Christ. Tombs dating from the time of Jesus (the period of the Second Temple) are located further north of the city than either the Church of the Holy Sepulchre or the Garden Tomb (Gabriel Barkay, “The Garden Tomb: Was Jesus Buried Here?” Biblical Archaeology Review, March/April 1986). Such an analysis of the Garden Tomb also serves to undermine any claims of authenticity that the Church of the Holy Sepulchre may hold. What many overlook is that such an analysis of the Garden Tomb also serves to undermine any claims of authenticity that the Church of the Holy Sepulchre may hold. The question that appears never to be asked by those who concern themselves with the tomb of Jesus Christ is why the writers of the New Testament were silent about its location. If it were to become an element in Christian belief and practice, surely it would have been established with authority in the first century. Is it not rather the case that it never did hold any attraction or significance for the early Christian Church? It can be safely stated that the true burial place of Christ remains hidden from human view to this day, just as the place where Moses was buried is hidden (see Deuteronomy 34:6). Clearly it is not part of God’s revealed purpose that such places become shrines and a focus of ritual worship. Perhaps the answer to the question of the silence surrounding Christ’s exact burial place lies in the instruction of the angels to the disciples after His resurrection: “Why do you look for the living among the dead?” (Luke 24:5, New Revised Standard Version). The Gospels proclaim that Jesus Christ came back to life by a miraculous act of God. The tomb was merely a temporary holding place, never to be venerated. Right worship lies not in endowing places with a holiness they do not possess. Rather, as Jesus once said to a Samaritan woman, “Believe Me, the hour is coming when you will neither on this mountain, nor in Jerusalem, worship the Father. . . . The hour is coming, and now is, when the true worshipers will worship the Father in spirit and truth; for the Father is seeking such to worship Him. . . . God is Spirit, and those who worship Him must worship in spirit and truth” (John 4:21, 23–24).